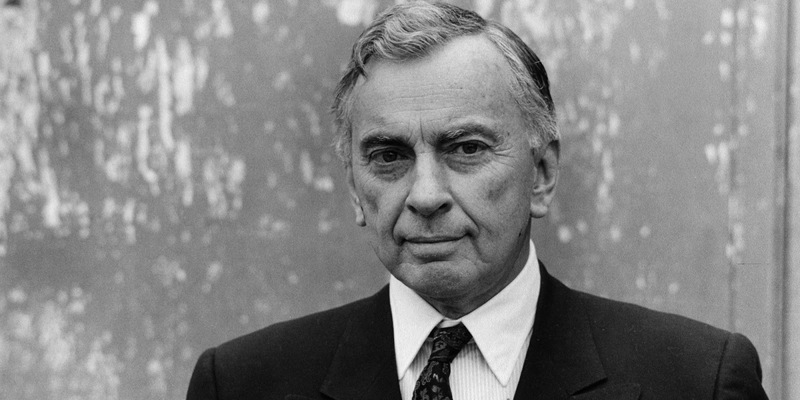 Esteemed literary biographer Jay Parini has published his anticipated work on the late novelist/playwright/essayist and gadfly Gore Vidal , Empire of Self . The book, we are correct to assume , is a nuanced and well researched story of a brilliant and complex writer who, while viewed sympathetically by Parani, is given, all the same, a warts and all treatment. A man of prodigious verbal gifts and frightful intellect and attendant wit,he was a mass of bad habits, bad faith, duplicity, opportunism and ,not surprisingly, a writer supremely engrossed in the pursuit of his own needs, desires, feuds. The title more or less gives away that bit of what is actually an engrossing story of a remarkable, if problematic artist,, but that seems to be the case as biographies of our greatest artists, poets, philosophers and politicians continue to come out; everyone great person's closet of skeletons gets air out sooner or later. 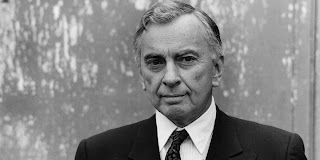 Not surprising,the he conservative The Weekly Standard takes the opportunity in their review of Jay Parini's biography of the late author Gore Vidal to ask a question they've been dying to put out there for decades: will the reliable acerbic scourge of the American Right Wing be remembered, if at all , more as a minor league celebrity irrelevant beyond his time than he would as a writer? Now is a convenient time for them to put it out there and attempt to influence the collective thinking about Vidal-as-author. Not surprisingly, Parini's biography highlights a problematic figure in Vidal, someone who , though gifted with fierce intellect, quick wit and an imagination that often times approached genius, was a self-obsessed , vindictive, cold and generally nasty personality who was likewise beset with foul combinations of alcoholism, paranoia and a penchant for conspiracy theories that were absurd on the face of it. His is the case with many great artists who die after a long life of deeds and misdeeds and, certainly , a good amount of work. Vidal on his best days never rose above the station of being a human being cursed and/or blessed with conflicting impulses he indulged with equal fervor. But DH Lawrence said it best when he advised that in the art of fiction, at least, one should "trust the tale, not the teller." To that end, Vidal's novels are uneven, as are the bodies of work of most writers I've followed who are/were prolific in their imaginative out put, but Vidal's is the the case where there is enough solid narratives , invention and courage that his standing as a good,smart,challenging read are is rather firmly cemented . "Burr","Creation", "1876". "The Pillar and the City", ,"Lincoln"...it turns into a respectable list, very respectable. Although generally well reviewed as a novelist for most of his career and someone who was able to land a good number of his books on the New York Times Best Seller Lists, he has, I believe, been given the short shrift in critical estimation for his fictional work. Like his friend/nemesis Norman Mailer , who had been cursed with the left handed compliment that his journalism was more brilliant than his novels, Vidal was subjected to the dismissive summary that while he was a literary essayist of very real genius (a view I won't argue with),his novels, from his boldest and most daunting pieces to his less worthy pot boilers, lacked the poetic grace that marks novelists of established greatness. There's a habit among too many of our critics to mistake grandiloquence with eloquence, prolixity with sophistication. Vidal's genius in his strongest fictions was to take an impossible amount of historical information,subject it to imaginative reinterpretation or filtered through a handily devised set of "what if" devices, and to present a counter mythology , full of greed, ambition, malice, power seeking in a tragic battle among different parties who believed they were struggling to achieve the Greater Good. Vidal's prose ,while not overtly ornate--it was refreshing that there was a serious novelist during the period who didn't feel the need to try and out-box either Hemingway or Nabokov in the art of the sentence--was vivid all the same, with with quick character sketches, rapidly but carefully exposition, subtly advanced conflicts and unexpected turns of fortune. He belongs , perhaps , to another tradition altogether, a European tilt toward the Novelist of Ideas. His kin are Voltaire (Candide), Sartre (Nausea), Aldous Huxely (Brave New World), Thomas Carlyle (Sartor Resartus). Too late for the Old School, the nineteenth century writers he doubtlessly would have felt comfortable being included with, too early for the mix and max aesthetic and strategies of the post-modrernists of Pynchon, DeLillo and David Foster Wallace would come after him. My guess is that there is a generation of younger critics who will make the case for the best of Vidal's art. He had his failed experiments, his mean and grating satires, his half baked efforts that seemed no more than outlines messily assembled in the vaguest resemblance; those will be forgotten, of course, and the best work will remain. He is simply too good , too fascinating, too much a part of his era to not be read, taught, debated for decades to come. Much the same is true of his favorite feuding partner, Norman mailer,for whom there is yet a new groundswell of interest in the actual writing he did. The same will happen for Vidal who, though sadly and seriously flawed and perhaps not the man you'd want to have over for dinner , deserves respect for the genuine seriousness he did bring to his work both as novelist and essayist. I will read Parini's bio and will again ask myself the question if one needs to be a self involved monster of a sort in order to be a writer on the level of greatness Vidal often times achieved in his life.